There are Luxury Hotels in Napa Valley… and Then There is …. Sheer Poetry! It’s tough to open a new luxury hotel in Napa Valley. You have to upstage the old dowagers like Auberge du Soleil and Meadowood, and you have to blow past other newbies like Calistoga Ranch and The Carneros Inn. But construction king, inveterate jogger, winery owner and art supporter, 51-year-old Cliff Lede (pronounced Lay-dee) likes a challenge, so he decided to build Napa Valley’s newest, ultra-premium hotel. And in so doing he hasz-o-o-o-o-m-e-d past all the rest. 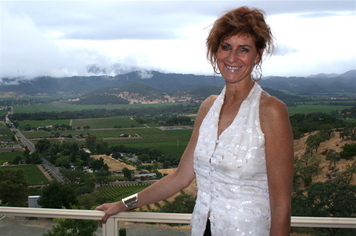 In fact, Poetry Inn is the ONLY accommodation in the Stags Leap District wine appellation, according to innkeeper Monica Collins. Equally unique is the visual statement that Lede chose to make, opting to build his inn 500-feet off the valley floor, half-way up the side of the Vaca Mountains, on the eastern flank of Napa Valley. The views from the property are breathtaking. You can see a dozen hot air balloons lift-off from nearby Yountville most summer mornings and the air is so rich it seems to have texture, as you deeply inhale. To design Poetry, Lede chose Napa Valley’s reigning top architect, Howard Backen, who has designed Harlan and Bond wineries, as well as Cliff Lede’s own winery, as well as… oh… the list goes on. 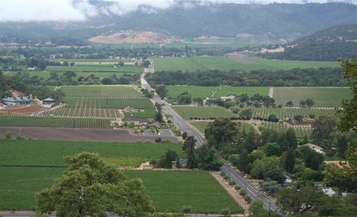 Poetry Inn is located at the intersection of Yountville Crossroad and the Silverado Trail. Couldn’t be easier to find; couldn’t be harder to book space. Open since March, 2005, Poetry Inn is fully booked every night for the next three months, says innkeeper Collins. Now, you could argue this isn’t hard to do, considering there are only three bedrooms (each named after a famous American poet -- ee cummings, Robert Frost, R. L, Stevenson,). And you would think that with room rates running $650 to $1320 per night in high season there would be vacancies. But Poetry Inn is a one-of-a-kind attraction in a valley that supports architectural originality. Think “Opus One,” or “Carl Doumani’s new “Quixote Winery,” both nearby, which are tourist destinations as much for their building design as for their wine. Poetry Inn is a luxury sanctuary that is literally far (and high) away from the bustle of everyday life. In many ways, the location is more suited to mountain goats than visitors. The road up (and down) is steep. Did I say steep? What I meant is: while the hotel policy is that pets are not permitted, you wouldn’t want to bring your dog anyway. The driveway down to the flat lands, where you would walk your dog, is so steep that you and Fido would BOTH have shin splints if you attempted the journey on foot!. Room amenities at Poetry are rich, and numerous, as I found out visiting a just-vacated room. Every room has a king bed, a wood-burning fireplace, a flat panel Sony WEGA TV, a JBL iPod docking station and complimentary wireless internet access. Every room also has dual bathroom vanities, in-floor heating, a large indoor soaking tub, an indoor shower, a private balcony and an outdoor shower with rain shower head. “We have the cleanest guests in Napa Valley,” says innkeeper Collins, who says some guests pride themselves on taking numerous outdoor showers throughout the day because it is so much fun. “It’s something they can’t do back home,” she explains. Rooms range in size from 850- to 1,450-square feet. At Poetry Inn, when you check into your room you are confronted with a first-growth Bordeaux wine, which is available for your drinking pleasure. The note from Cliff Lede, whose passion is Bordeaux wines, invites guests to enjoy the wine; a fee of $250 will be added to their bill if they choose to enjoy the wine with complimentary cheeses sent to the room. This week, guests will find the 1994 Chateau La Tour, or the 1994 Chateau Mouton Rothschild, in their room upon arrival. What’s more, to share the pleasure of wines, Cliff Lede stocks a 500-bottle cellar on the premises; guests are encouraged to visit the cellar and pull from it any of the Bordeaux first growths or any of the Cliff Lade wines and take them to the lounge, to their room, or to dinner in the valley. 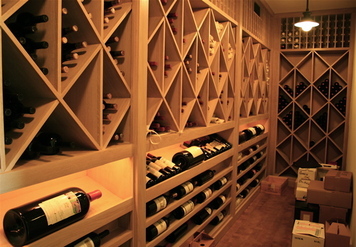 A wine list with all selections and prices is provided in each guest room. first-growth Bordeaux and Cliff Lede wines. Wine-loving guests at Poetry Inn may also enjoy a complimentary 90-minute tour of Cliff Lede Vineyards, at the foot of the inn; this includes a tasting of all current releases. Guests who do not have the time for a formal tour of the winery may partake in their own "in room" tasting, as each room is stocked (for sale) with no fewer than two white and three red Cliff Lede wines. Not like your every-other luxury hotel at all. As many visitors to our valley are lured by our many first-class restaurants, Cliff Lede realized it would be folly to offer dinner; instead, he cleverly decided to offer the one meal of the day that ALL guests will take as they sit on their private hillside balcony, dressed, if at all, in the hotel’s 8-million-count Egyptian cotton spa robe, which is actually so thick that it is guaranteed to muffle the sounds of your happy, gurgling stomach as you chow down breakfast. Each morning, guests are treated to a sublime 3-course gourmet breakfast, served to their room or on the terraced balcony on the level of the inn’s lounge. “We grow all the herbs and in summer, grow the tomatoes and cucumbers, which we serve at breakfast,” says innkeeper Collins. 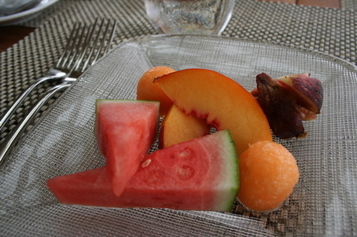 We are forced to change our menu regularly, even for breakfast as many of our guests return numerous times. One of the mentionable things that guests may consider doing horizontally in their room – have a massage. 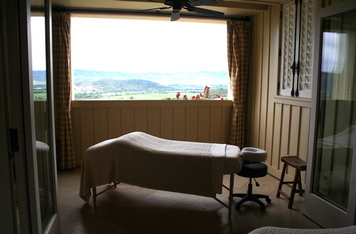 Call the innkeeper and ask the masseuse to stop by your room. But back to breakfast. 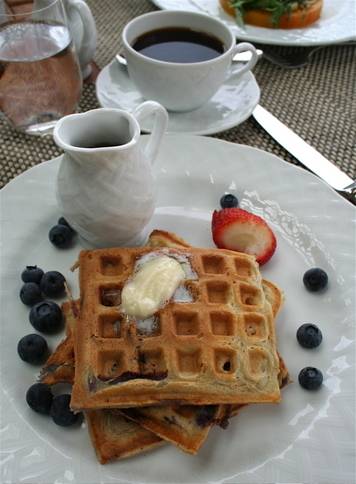 The real idea behind hitting the stack of waffles at 8 am is that guests need to carbo-load if they’re going to hit the trails and visit wineries all day. The idea is that, with any luck, you might soak up some of the wine BEFORE it even stains your brain. While the Yountville-based, early morning hot air balloon lift-off is a thrill for first-time visitors to Napa Valley to see, but for those lucky few staying at Poetry Inn, they get to see the balloons at eye-level as the flotilla floats past! Now, that’s a thrill. I couldn’t sleep at Poetry Inn this week, as all rooms are booked. I think the innkeeper said until 2050, but that could just be selective hearing. But I did manage to get invited to breakfast, to sample the sumptuous 3-course meal. 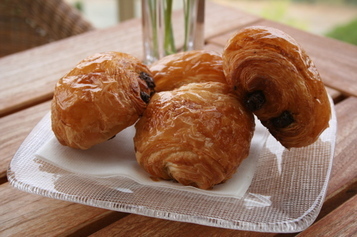 First course: A selection of croissants, or pains aux chocolates with fruit juice of your choice. And lots of Illy café. 3rd course: Your choice, golden blueberry, or cherry waffles or a perfectly cooked poached egg, served with a slice of organic tomato, garden arugula, and homemade rosti potatoes. If the food, location, design and amenities of Poetry Inn don’t grab your interest, perhaps M’ssieur would be interested in “The Ultimate Birthday Bash,” offered by Poetry? For a mere $60,000, five couples can take over the entire inn for a long weekend (book early, book far out, there is already a waiting list!). 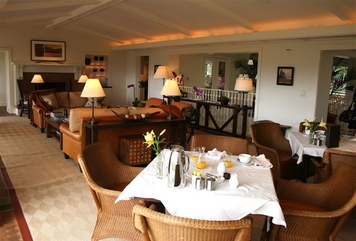 Thomas Keller, of French Laundry fame, will cook a meal for your group and serve it in the hotel’s lounge/dining room. Another night you will dine at Bouchon, in Yountville, and on your last night, you will dine at Ad Hoc, also in Yountville. All food, all wine, all gratuities are included. Because of the hotel’s small size, there is a somewhat restrictive, but understandable, cancellation policy. The hotel requires a deposit for the first and last night at the time of booking (or total pre-payment for a two-night stay), with the balance due 14 days prior to arrival. 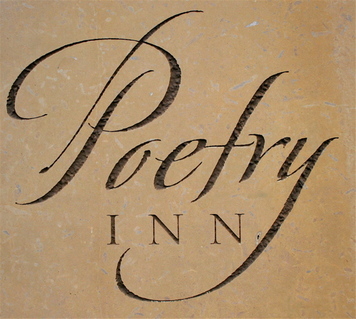 For reservations contact the hotel at visitus@poetryinn.com, or call 707-944-0646. The actual location is 6380 Silverado Trail, in "greater Yountville," if you'll pardon the expression.